Baseball has always been a game of numbers. With the new wave of baseball analytics, numbers populate the sport even moreso today, but there has been a growing trend with the Philadelphia Phillies that no analysis could cure. 81, 73, 73, 63, 71 and 66. It sounds like a lottery drawing, but those are actually the Phillies' win totals over the last half-dozen years, a stretch in which, despite the five-straight National League East Division titles that preceded it, the Phils failed to finish over .500. This year, there is the sense that change has arrived. Carlos Santana was signed to a three-year, $60-million deal, and former Cy Young winner Jake Arrieta came aboard on a three-year, $75 million deal. Those signings alone indicate the Phillies want to make a push right now to contend — and with blossoming young talent like Rhys Hoskins, Nick Williams, Jorge Alfaro, J.P. Crawford and Aaron Altherr around — the ingredients are there to possibly win 84-to-86 games this season. There could be some obstacles in getting there: a shaky starting rotation after Arrieta and Aaron Nola, who was superb on Opening Day going 5.1 innings, giving up three hits and one run on 68 pitches; a shaky bullpen that failed miserably against the Atlanta Braves in blowing a 5-0 lead; and the shaky psyche of third baseman Maikel Franco. They also may have to to overcome some shaky baseball decisions by new manager Gabe Kapler. Winning 86 games is possible for this team, if things go right. Steering that course is where the biggest problem may be. Kapler could be a disaster waiting to happen, a used-car salesman that caught Phillies general manager Matt Klentak and primary owner John Middleton hook, line and coconut oil. Or, he could be someone that Phillies’ fans will need to be patient with, like the rest of this young team, and grow accustomed to Kapler’s “bold,” outside-of-the-box decisions. Kapler is a big believer in Gabe Kapler. After all, that's likely how the 42-year-old former player, who looks more like John Cena in a baseball hat than a big-league manager, sold himself to the Phillies despite zero managerial experience at any level. The jury is clearly still out, but if one game is any indication, Kapler may have a tendency to over-manage, to outthink himself when he should let the game flow organically to him. The obvious red flag is when he pulled Nola in the sixth of Thursday’s game in Atlanta when he didn’t need to fix anything. Maybe that was Kapler’s way of validating his importance. Phillies manager Gabe Kapler, left, pulls starter Aaron Nola, right, in the sixth inning against the Braves. It just gets scary when every move Kapler made backfired significantly. He pulled Nola, only to have his hand-picked reliever, Hoby Milner, serve up a two-run homer to Freddie Freeman. The numbers told Kapler that Milner didn’t allow a homer to a left-handed batter last season, instead of trusting his eyes — and everyone else’s — and sticking with his No. 1 starter in Nola, who was doing a very good job in his first start of the year. A cascade of errors followed, when reliever Adam Morgan allowed a homer in the eighth, followed by Edubray Ramos giving up a game-tying single later in the same inning. Kapler then called on closer Hector Neris in the ninth, who proceeded to give up a three-run walk-off home run to Nick Markakis with two outs and a base open. Kapler used five relievers and, in just 3.1 innings, they were tagged for seven runs, six of them earned, on six hits and three walks. So much for the dawning of Kapler’s "Be Bold" mantra. 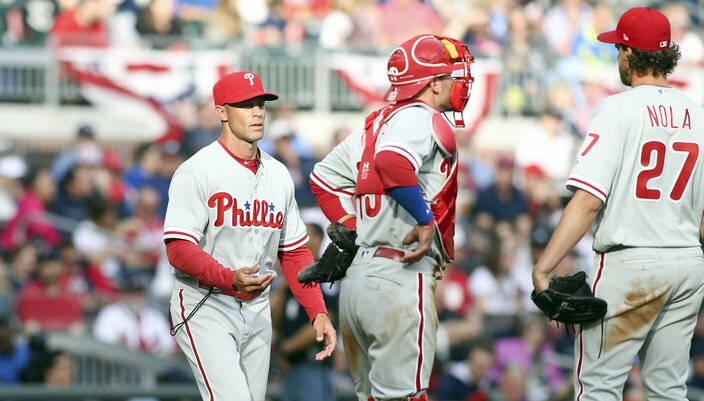 "Look, tonight, the decisions didn’t work out in our favor," Kapler admitted after the game. "But I’m very confident that over a long period of time that they will." Despite Kapler’s clumsiness, one thing is apparent: The Phillies want to win — and they want to win now. As Arrieta said when he signed with the Phils a few weeks back, "I intend to come in here and win right away." Thursday's loss doesn't close the door on that being a possibility in 2018, it's just a reminder that a few things still need to be cleaned up first. The Phillies haven’t scored more than 700 runs in a season since they last won a division title in 2011. They haven’t outscored their opponents since landing 81-81 in 2012, when they scored 684 runs and gave up 680. Last year’s 66-96 mark placed them in last place in the National League East for the third time in the last four years, 31 games out of first place — the most games they've been behind an NL East frontrunner since 1998. Now with Santana, Hoskins, Williams, Altherr and others in the middle of the lineup, the run production should be up. After the 2017 All-Star break, the Phillies averaged 4.77 runs a game (358 runs over 75 games), the 13th best in MLB, and finished 37-38 in that span. They also gave up 358 runs in the second half of the season, after they were outscored by 92 (332 runs scored; 424 runs against) in the first half. Of course, that was before the arrivals of Hoskins, Williams and Alfaro. Meanwhile, Franco, 25, needs to be producing closer to where he was in 2015, and if not, 24-year-old Scott Kingery will certainly step into that void at third. One other thing to consider is how young this team is. Crawford is 23, Nola, Alfaro and Williams are all 24, Hoskins is 25, and Odubel Herrera, though it seems he’s been around forever, is just 26.
.@EliasSports says the Phillies' roster is the average age of 26 years, 334 days old. It is the youngest roster in MLB. So, this is a team that will need to be shown patience as it matures (Alfaro, Williams, Crawford, and Hoskins have played in a combined 194 major league games). Pitching-wise, after Nola and Arrieta, it’s actually anyone’s guess. There’s Vince Velasquez, Nick Pivetta and Ben Lively, all righties, like Nola and Arrieta, and all filled with more questions than answers. Velasquez is the baseball equivalent of Eagles’ tight end Zach Ertz, where each year everyone waits for this vast potential to surface (it finally did with Ertz this past season). It’s yet to happen with Velasquez. In 2016, Velasquez was up and down, though he was 8-2 with a 3.32 ERA through July 8 in 15 starts. Then he went south, finishing the year 8-6 with a 4.12 ERA. Last year, he was 2-7 over 15 starts with a 5.13 ERA. Pivetta was 8-10 with 6.02 ERA in 26 starts in 2017, and Lively was 4-7 in 15 starts, with a 4.26 ERA. Both are unpredictable. Help could come from Jerad Eickhoff, yet another right-handed pitcher, who reportedly is out six-eight weeks due to a strained lat muscle, and righty Mark Leiter, who is on the disabled list with a flexor strain in his right forearm. As for the bullpen, well we saw what they're capable of during Thursday's collapse in Atlanta. Neris is the closer, with middle relief coming from Milner, Morgan and Ramos. The Phillies also paid quite a bit for set-up righties Tommy Hunter and Pat Neshek, both of whom were sidelined on Opening Day with injuries. Still, there are the makings of a good season here for the Phillies. 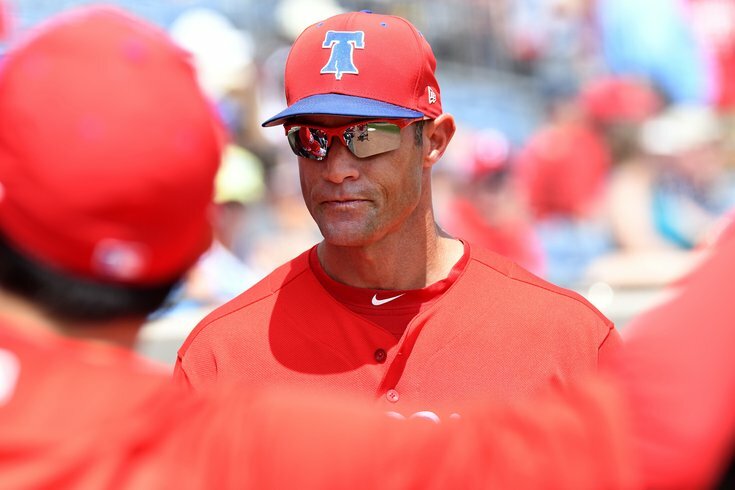 Let’s just hope the first incarnation of the Kapler Era is a momentary blip and not a constant reoccurrence – or Phillies fans may soon be asking if Doug Pederson knows anything about baseball.